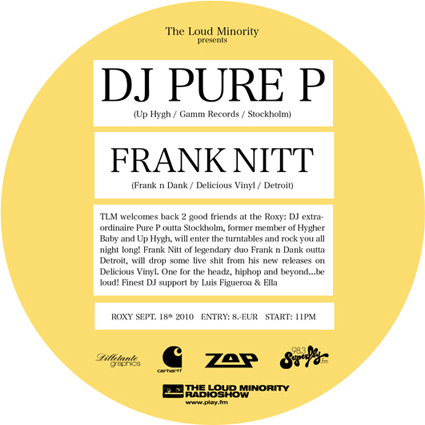 The one half of the legendary duo Frank n Dank comes around to drop some exceptional raps in order to introduce his latest output on Delicious Vinyl. The other guest is Pure P from Stockholm. Those who saw him djing for Swedish crews like Hygher Baby or Up Hygh know: he will scratch you mad. So no excuse for all Viennese Hip Hop cats and those who are in town for weekend sightseeing business: come by and wave your hands in the air.